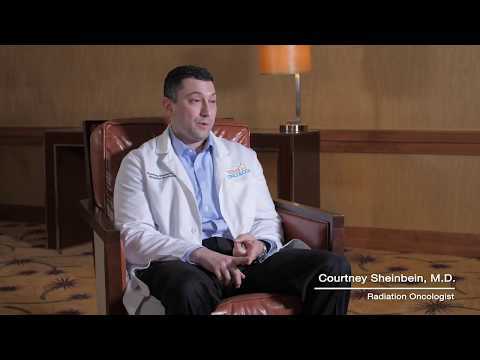 Dr. Sheinbein is trained in 3D-Conformal Radiotherapy, Intensity Modulated Radiotherapy, Image Guided Radiotherapy, Stereotactic Radiotherapy, Stereotactic Body Radiotherapy, and brachytherapy. Dr. Sheinbein treats all types of malignancies as well as benign conditions including cancers of the head and neck, cancer of the central nervous system, breast cancer, lung cancer, esophageal cancer, gastrointestinal cancers, and prostate cancer. He has a special interest in stereotactic radiosurgery and stereotactic radiotherapy which can treat tumors in as few as one to five sessions, with an efficacy rate similar to surgical resection. Dr. Sheinbein’s passion is helping patients through the difficult time of their diagnosis and treatment of their cancer. He understands that each patient has a unique story and strives to meet their individual needs. In his free time, he enjoys spending time with his family and friends, organic cooking, and physical fitness and wellness. Served as an officer for many years including as President, President-Elect, Treasurer, and Board of Censors, currently serving as President 2018. Postoperative Intensity Modulated Radiation Therapy (IMRT) for Head and Neck Cancer: Does the Scar Need to be Included in the Clinical Target Volume?